There’s a lot you can do with our Printable Monster Themed Pom Pom Mats! 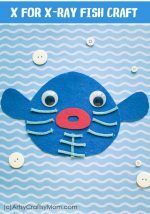 Hone your fine motor skills and hand-eye coordination with pompoms, buttons & more! Is it just me or are you seeing monsters everywhere too? Well, since it’s Halloween, it’s hardly surprising if you do! Miss P and I are big fans of the Monsters, Inc movie – I think the movie completely does away with the ‘monsters under your bed’ myth! We’ve been in a monster phase recently, making potato print monsters, monster bookmarks and of course, monster treat bags for Halloween. We just realized that most of these are for preschoolers and older kids, and our little ones don’t have any monster crafts to do. And that’s why today we present our printable monster themed pom pom mats, specially for the younger crowd! 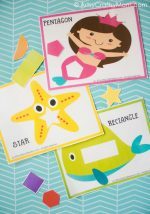 These mats are multipurpose – they help enhance hand-eye coordination, fine motor skills and also teach about colors. Plus they offer a variety of play options, as you’ll soon find out! 1. Make sure you print out the Monster themed pom pom mats on good quality, thick paper or card stock so that it can withstand hours of play. 2. Pom Poms – Hand your child a cup of multicolored pom poms and a tweezer. Place a monster mat in front of her and let her try to place matching pom poms on the colored circles on the monster’s body. She can start off with her fingers, but the tweezers will help to enhance her motor skills further. Try plain pom poms and glittery pom poms for a change in texture. 3. Buttons – Just as you did with the pom poms, gather some colorful buttons and let your munchkin place them on matching circles on the monster. This could be a little more challenging, since the buttons aren’t as easy to grip as the pom poms. 4. 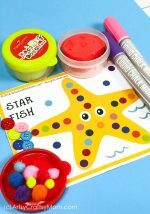 Play dough – For play dough use, it’s best to laminate the mats, so that they can be cleaned and reused. Get the mini tubs of different colored play dough and let the kids roll out little balls and then flatten them to place on the colored circles. This is bound to be messier, so be prepared! 5. Chalk Markers – Our pom pom mats are in full color, but that doesn’t mean that you can’t add details to them! Use colored chalk markers to add extra horns, arms or feet to the monster. 6. Color Recognition – Every monster has a base color, which is also mentioned next to it. 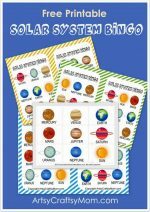 Use the mats as flash cards to help kids learn the color names. For slightly older kids, let them take a look around them and use chalk markers to write down whatever they see in that particular color. There you go, so many activities to do with these cute little monster themed pom pom mats! 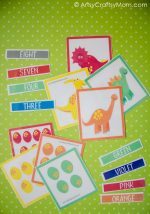 These go well with the dinosaur pom pom mats, the dinosaur shape match, fruit shape match, bug theme pom pom mats and the spring play dough mats. Kids can also go ahead and customize the mats to make their own wall art. 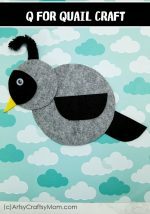 Add googly eyes, stick on some feathers or other embellishments and make each monster your own. I’m sure they’re not going to complain!